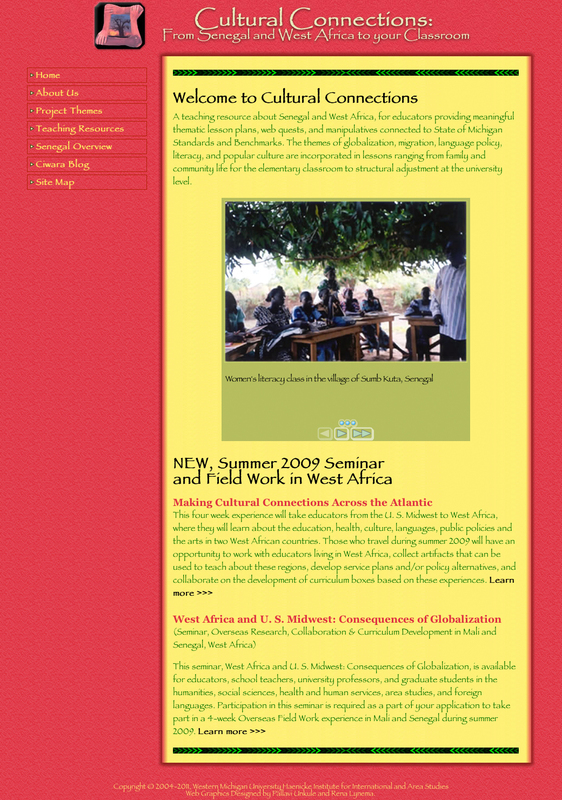 During the second quarter of 2011 I had the opportunity to work with W.F. 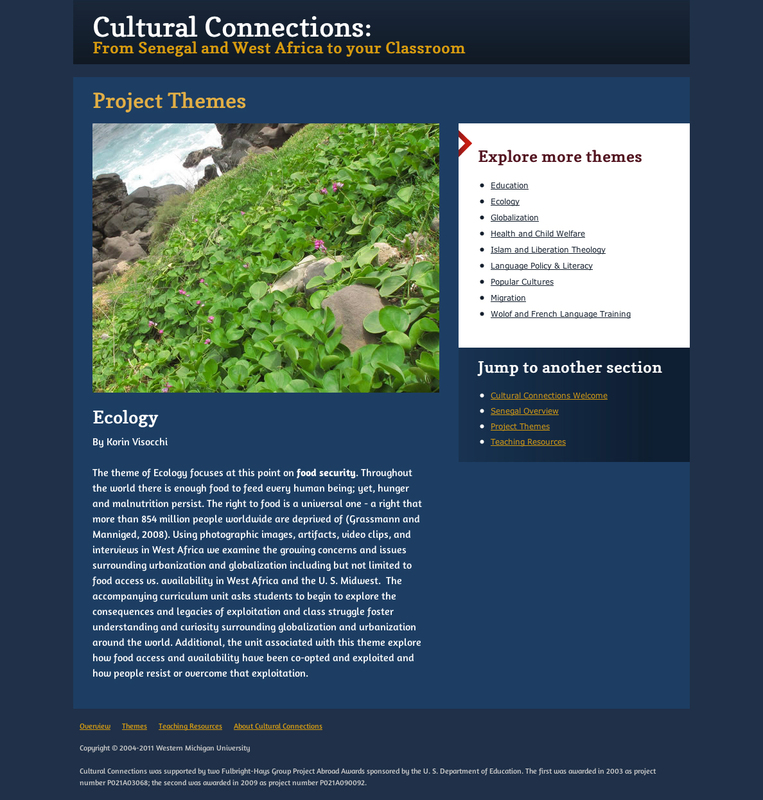 Santiago-Valles, Ph.D. and Yvette Hyter, Ph.D.–two very talented and passionate professors–to redesign cultureconnections.org. 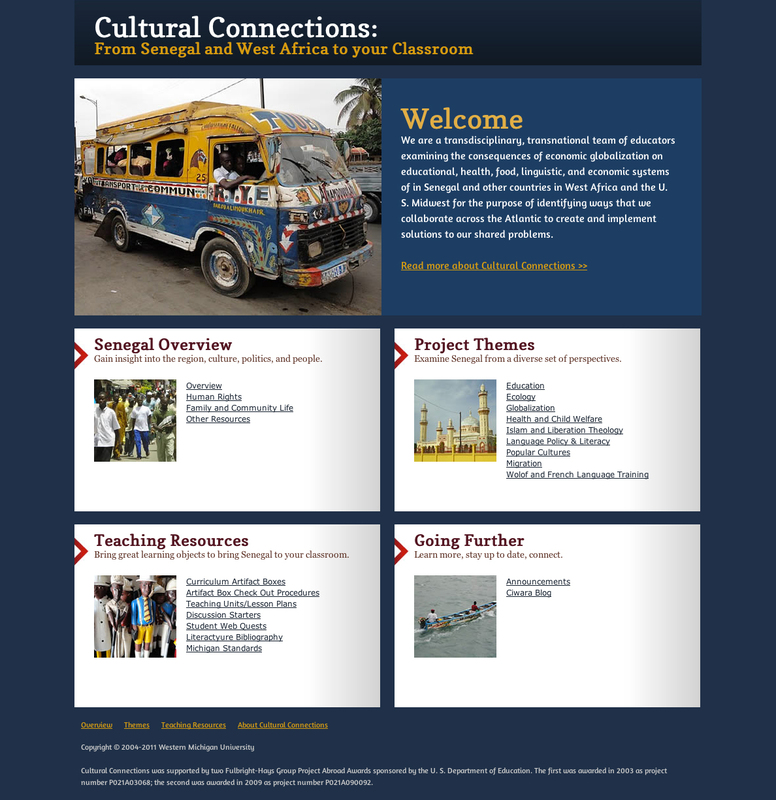 The website is part of a second Fulbright-Hays Group Project Abroad Program Award the professors received to address gaps in the inclusivity of Michigan K-12 and higher education curricula. Landing page layout focused on presenting content first (meaning, photo and text for the subject/topic of the page is displayed immediately in the upper left region of the page, just below the masthead), section navigation second (a navigation tool along the right side of the page, and a jump navigation to move between main section of the entire site). Overall, I liked how this worked out — our implementation “felt right” as we conducted usability testing and evaluation: the visitor selects a section from the homepage, reads the content first, is able to focus on where they might want to go next, and proceed with their session. In other design/layout options, visitors often have to evaluate pages in a convoluted way–“is this the page I was looking for”, “is what I needed in the primary navigation”, “is what I wanted in the secondary navigation”. With the layout we designed, the visitor winnows down to what they need from the home page using categorized panels, reads the content, can choose to explore the section in more detail using the section navigation tool, or jump between main sections of the site. Every project has strengths and weaknesses. 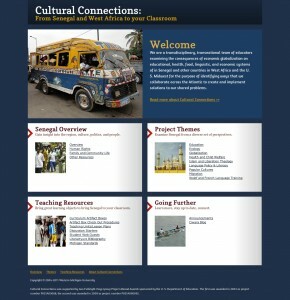 If you were to compare the 2011 redesign to the original 2003 Cultural Connections website, I think you would agree that the new site is an improvement that integrates new design trends, practices, and thoughtful solutions. I think we should respectfully salute the original design for its eight years of service (a long stretch for any site design). While we were very effective in allocation of the budgeted hours for the project, I would have liked to spend a little more time including additional accessibility features/functionality, more layouts, additional polish on interface elements and HCI cues, consideration of how content might be presented to enable students to use the materials as well (the target audience for the current site is faculty, instructors, and staff), and providing content within the units/tools section itself in multiple formats (e.g., PDFs, editable assets like DOCs and PPTs). A project is never done. I always anticipate and feel excited about the next iteration of a project. I am thankful for the opportunity to have worked with Santiago and Yvette–who are brilliant and passionate about their work. It was also fun to work in the capacity of web developer, graphic designer, writer/editor, project manager, etc. (like a mini, one-man agency).